The Chad-Cameroon oil pipeline has had negative impacts on local population livelihood and is a meager source of income for alleviating poverty. In June 2000, in spite of a three years global opposition campaign, led by local population and International NGOs, the World Bank financed the Chad-Cameroon Oil Pipeline, a 1,100 km (685 mile) pipeline for crude oil from southern Chad, through tropical forest, to Cameroon’s Atlantic coast. The project also included the construction of 300 oil wells in Chad. The Cameroonian rainforest covers an area of about 20 million hectares, some 40 percent of the national territory. Besides posing a serious threat upon the biodiversity and the ecosystem of the country, the construction of the oil pipeline and the subsequent deforestation generated serious social conflicts, and deprived local indigenous communities of territorial resources and traditional livelihoods, especially the Bakola Pygmy people, who rely on hunting and gathering. Bantou villagers claimed Pygmies’ lands as theirs and received the compensations which were due to the Pygmies. In 2002, a project by Forest Peoples Programme helped resolve some of the long-standing rivalries between the Bantou and the pygmies. Overall the compensation plan by Cameroon Oil Transportation Company (COCTO) is insufficient. And so was the “Indigenous Peoples Programme”, implemented by the FEDEC, which was not adequate to the Pygmies’ needs. - A rise in HIV/AIDS after the laying of the pipeline -Concerns over quality and adequacy of compensation packages -Loss of livelihoods among fishermen -Inappropriate waste management -Work related accidents and inadequate compensation - Displacement of and improper compensation to, an indigenous community - Concerns about sub contractors and compensation process and levels -Concerns regarding royalties for the passage of oil through Cameroon. In spite of the multiplication of reports or monitoring entities (such as the International Advisory Group or the External Compliance Monitoring Group) following up on the situation and set up by the World Bank, the international institution has demonstrated its incapacity “of influencing the operations of oil companies in any meaningful way, so that they become more respectful of the environment and the rights of the affected communities and workers“. The pipeline also has severe consequences on Chad. Scandals bust up denouncing that the government finances its war against the rebels in the North and East of the country with the revenues from oil. None of that money has benefited the local residents affected by the pipeline, while its route is very close to Chad’s most fertile region. Project Details The Chad-Cameroon Oil and Pipeline project was created to transport oil extracted in southern Chad - a country without access to the sea- to the Gulf of Guinea and from there to European and North American ports. The Chad-Cameroon project involved the opening of 300 oil wells in southern Chad and the construction of a huge 1,100 km (685 mile) pipeline. The project was led by the World Bank together with the three big oils company consortium: Exxon, Chevron and Petronas and COCTO, the Cameroon Oil Transportation Company. Since June 2014, Chevron is no longer part of the consortium. The oil multinational "sold its 25 percent non-operated interest in a producing oil concession in southern Chad and the related export pipeline interests to the Republic of Chad for approximately $1.3 billion" . The Environmental Defense Fund calculated that under optimum working conditions, the pipeline carries a peak of 225,000 barrels of oil per day. The construction of a new oil terminal in Kribi was confirmed by the Cameroonian government by the end of 2015. The new infrastructure will annually export 3 million tonnes of crude oil. 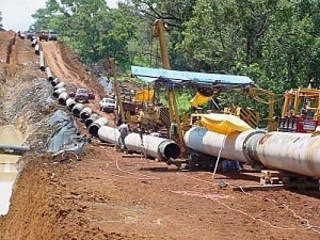 The World Bank announced on September 9, 2008 that it was ending its support for the controversial Chad-Cameroon pipeline which was already bult. The announcement came after the Chadian government repaid $65.7 million in outstanding loans to close out its debt to the Bank for the project. Why? Explain briefly. September 2008: The decision of the World Bank to stop financing the pipeline project results in irresolvable disagreements with the NDjamena Government in Chad, and ends with the financial institution demanding repayment of a US$ 140 million loan in advance. The Government also breaks its commitments made with Washington bankers to divert part of the oil revenue to a special fund for combating poverty in the country. So, the pipeline was builts and it operates. The idea of Chad constituting an untouchable interest yielding fund for futures generations, with the revenues (which the WB promoted) failed. Eriksson H., Hagstrmer B., Chad-Towards Democratisation Or Petro-Dictatorship?, Ed. Nordic Africa Institute, 2005. Broken Promises, The Chad Cameroon Oil and Pipeline Project; Profit at Any Cost?, 2001. The Courier ACP-EU, Doba-Kribi pipeline, How will the Pygmies fare?, January - February 2002. Forest Peoples Programme, Securing indigenous land rights in the Cameroon oil pipeline zone, July 2007. They Came Here to Kill Us: Militia Attacks and Ethnic Targeting of Civilians in Eastern Chad, Ed. Human Rights Watch, 2007. Amnesty International UK, Contracting Out of Human Rights: The Chad-Cameroon Pipeline Project, Ed, Amnesty International UK, 2005. FOCARFE, CED, ERA, SeP, Rapport de Monitoring Independant du Projet du Pipeline Tchad Cameroun, 2002. Mbongo Endeley, Joyce, B.; Sikod, Fondo. The social impact of the Chad-Cameroon oil pipeline: How Industrial Development Affects Gender Relations, Land Tenure, and Local Culture, Ed. THE EDWIN MELLEN PRESS, 2007. Traversing peoples lives: how the world bank finances community disruption in Cameroon, FoEI 2002. Other Comments The project was presented as a potential success in managing the revenues of extraction to the benefit of local people and future generation. This failed.